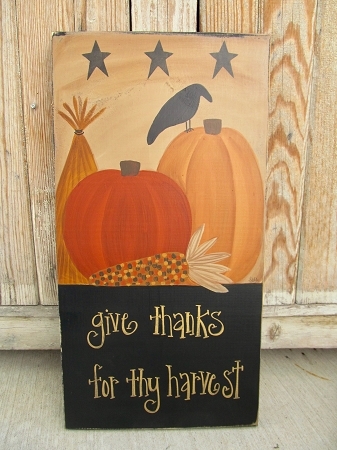 Primitive Give Thanks Fall Pumpkins Wheat and Corn Hand Painted Sign. As featured in Country Sampler Magazine! This sign is hand painted by Heidi right here at Gainers Creek at the time of your order. The sign displays 2 pumpkins in 2 different shades of orange, a wheat stalk, an ear of decorative corn, a crow and 3 black stars across the top. You can customize yours with the saying. Shown with Give Thanks for the Harvest. The sign has been painted on a pine board that measures 22"x11". Shown with a sawtooth hanger, other options are available. Edges are sanded for a time worn primitive look. Hand painted, designed and signed by Heidi.